One of my friends from DeWitt’s Corners said that they’d seen a robin in their back yard, but I hadn’t seen one yet. The only sign of spring that I’d noticed was the steady drip of water, coming off of the old roof, in the late afternoons, when I returned home from Glen Tay School. That meant that the temperature was rising above freezing during the day, so the sap must be running again. 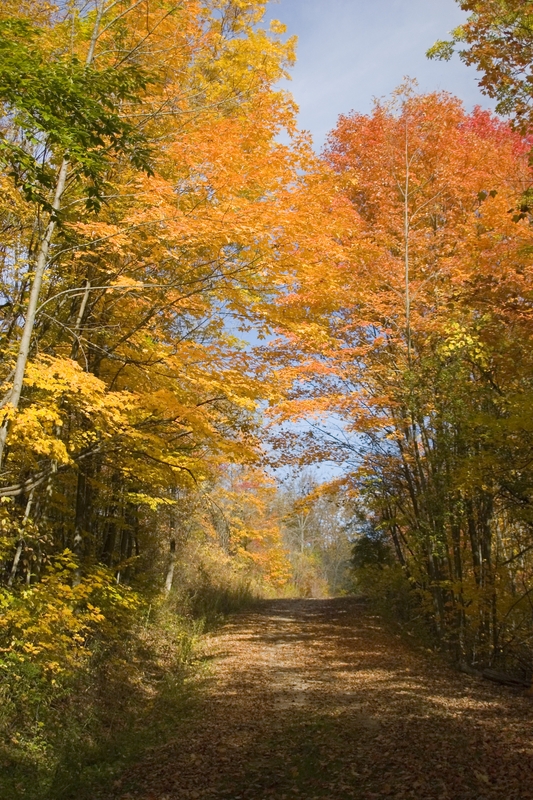 Sure enough, that same day, I saw Dad heading down the lane, toward the Third Line, and he had his carpenter’s auger in his hands. That old thing looked battered and ancient, but it sure did the trick when he needed to tap some trees. We didn’t have a big maple bush like Korry’s, across the road, but Dad always tapped a few trees along the laneway, so that we’d have enough syrup for the family. If anyone had bothered to stroll past the trees that we’d tapped, they likely would have laughed themselves silly. It wasn’t exactly a professional operation. None of the buckets matched. We had a grey metal pail, that hung on one of the spiles by a rusty wire. We also had a white plastic bucket, that Mother had made, by cutting up an empty corn syrup jug. Another bucket was made from an empty Billy Bee honey container. We even used one of my old sand pails, that I’d played with on the beach, when we went to Silver Lake in the summer. Any available container was ‘fair game’. It was only for a few weeks after all, and they couldn’t afford to be spending money on something that was used for such a short period of time each year. 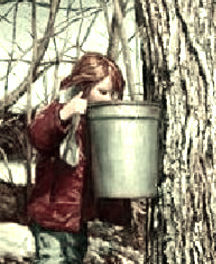 Looking back, it didn’t really matter what kind of buckets you used, as long as you had something to collect the sap. I used to stand at the side of the tree, and watch as the clear, sweet liquid dripped ever so slowly, drip, drip, and splashed into the bucket below. I’d lift the bucket off of the metal hook, and dump the sap into Mother’s biggest mixing bowl, hook the bucket back on the tree, and carry the bowl gingerly up the lane way, and into the kitchen. Mother would be ready with a piece of clean cheesecloth, stretched over the big aluminum pot on the stove, and she’d take the bowl of sap, and dump it into the pot. The cheesecloth would catch all of the little specks of dirt, or bits of wood, that had come from the tree, so that the sap in the pot was nice and clean. I guess if I’d been a little older, and a lot smarter, I would have asked Dad for one of the big pails from the garage, to transport all of the sap, in one trip, into the kitchen. Instead, I emptied one bucket at a time, into the big mixing bowl, and trekked all the way back and forth, up to the kitchen. Up the lane, and down the lane, I went over and over again, until I was finished; usually just before supper time. One night I forgot to empty the buckets, and the next night the sap was overflowing, running down the side of the tree, onto the snow. No one said anything about it, but I felt bad because I hadn’t done my job, and worse still we’d have less syrup because of it. The air in the old kitchen smelled sweet for those few weeks each year, as the sap boiled away on top of the stove. Usually by the third or fourth day we’d have enough for a little bowl of syrup for dessert. The first syrup of the year was always the lightest in colour and in flavour, perfect for eating straight out of the bowl. Dad liked to pour a little cream into his syrup, and give it a stir. He’d take a piece of day-old homemade bread and dip it into his creamy syrup mixture, until he was down to the last sweet drops, and then he’d do one last sweep of the bowl with his bread. The other kids in the family poured their syrup over vanilla ice cream, but I liked mine straight-up, with nothing getting in between me and that sweet, perfect, maple flavour. I’d take a melamine bowl and teaspoon out of the old sideboard, pour myself a little, and enjoy it just like that. The sun was shining a little brighter each week, and our driveway became a soggy obstacle course, as we stepped around the growing puddles of water. The snow banks finally shrunk, and shriveled away. Soon after, we’d take the buckets down, and put them away in the back porch for another year. Dad removed the spiles from the maple trees, wrapped them in a soft cloth, and placed them in the top drawer of his tool chest in the garage. By then, the maple trees were beginning to bud, and a few of the familiar spring birds were returning to Mother’s bird feeder, in the back orchard. Almost all of the snow had shrunk down to a few dirty white mounds, spaced here and there in the yard, and the ground was spongy, cold and brown. The sun grew a little brighter each day, and stayed up in the sky later and later, after supper each night. Spring wasn’t here yet, not even close; but all the signs were there that it was just around the corner. Each year when we tapped those maple trees, I knew that Spring was not far away. It was only a matter of time now that she’d be coming up the Third Line, with all of her delicate shades of green. She’d be bringing her warm sun, and her gentle breezes. She’d slip into our yard quietly one morning, and tell all of the flowers to wake up, and show their colours. She’d whisper to the squirrels and the chipmunks, and invite them to come back and play in our yard. I often wondered if Spring could see us tapping our trees, and if that was her signal to make her way back into Lanark County, and into our yard. Maybe there was something magical about the syrup, and once we’d had our first taste, Old Man Winter knew that it was time for him to pack up his snow, and his cold winds, and head up north. Either way, we always knew that as soon as the sap began to run we’d be seeing Spring in all of her glory in no time at all!